One of the defining characteristics of the 2020 Democratic presidential contest is the unprecedented diversity of the field, which already features more women and minority candidates than ever. But even more significant than the increasing variety of the contenders may be the growing diversity of the primary voters who will choose among them. 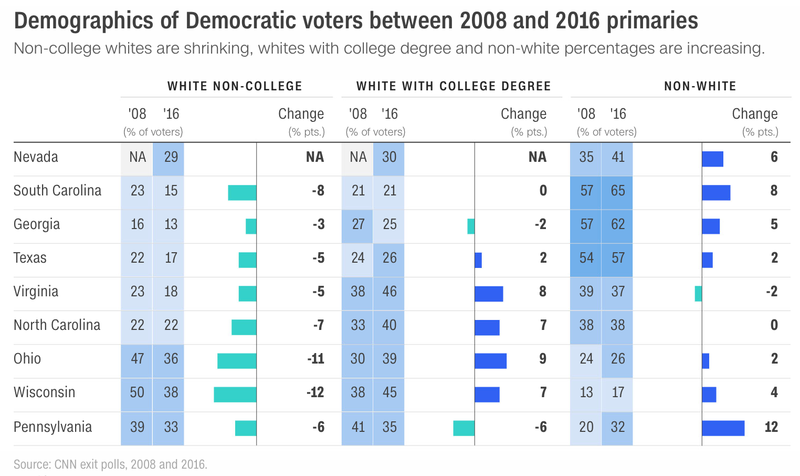 Over the past decade, the electorate in the Democratic presidential primary has grown more racially diverse, better educated and more heavily tilted toward female voters, an extensive new CNN analysis of exit poll data has found. Party strategists almost universally expect those trends to persist, and even accelerate in 2020, as minority, white-collar and female voters continue to recoil from President Trump. Just two of the demographic groups most alienated from Trump -- white women with college degrees and African-American women at all education levels -- could compose as much of two-fifths of all Democratic primary voters next year, the CNN exit poll analysis suggests. “The area of growth for 2020 is going to be more female, more educated and more diverse,” says Robby Mook, the campaign manager for Hillary Clinton in 2016. The area of growth for 2020 is going to be more female, more educated and more diverse. As those groups grow, the working-class white voters who once constituted the backbone of the Democratic coalition are likely to continue their long-term decline as a share of the primary electorate next year everywhere but the Rust Belt. From all these directions, it now appears likely that the most diverse field of presidential candidates in the Democrats’ history will face the most diverse electorate the party has ever attracted. To understand the likely composition of the voters who will decide the Democratic presidential nomination, CNN polling director Jennifer Agiesta gathered the results from all the exit (or entrance) polls conducted in 27 primaries and caucuses during the 2016 nomination contest between Hillary Clinton and Bernie Sanders. Then, to assess how the composition of Democratic voters has changed over time, CNN compared those results with a cumulative analysis of all the 2008 Democratic primary exit polls conducted at the time by Gary Langer, a polling consultant for ABC News. Because exit polls were not conducted in the same states in 2016 as in 2008, the results of the cumulative analysis are not exactly comparable. To provide another window on the trends, CNN also compared the composition of the vote in nine states from all regions of the country in which exit polls were conducted in both 2008 and 2016. Across several dimensions, big change is evident. In 2016, the cumulative analysis found, white voters composed 62% of all Democratic primary voters. That was down from 65% of all primary voters in the 2008 analysis. The white share was likely even lower than the cumulative result measured for 2016 because exit polls that year were not conducted in California and New Jersey, two heavily diverse states that voted after the race was effectively decided. 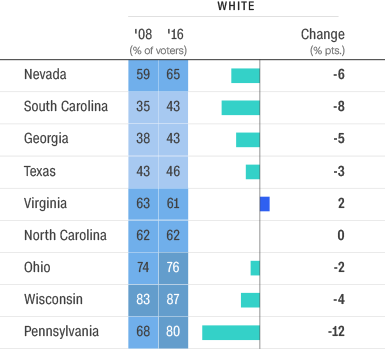 In seven of the nine states CNN analyzed, the white share of the vote in Democratic primaries declined from 2008 through 2016, often by significant amounts; it remained unchanged in North Carolina and increased in Virginia. 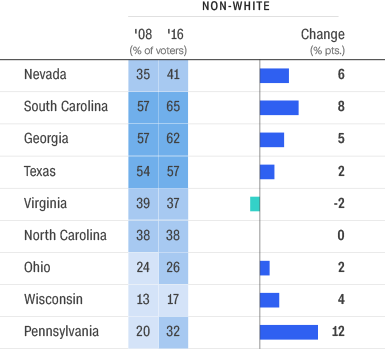 In Pennsylvania, South Carolina, Nevada and Georgia, the white share of voters dropped by at least 5 percentage points over those eight years. African-American voters rose from 19% of the cumulative vote in the 2008 analysis to 24% in 2016, while Latinos fell from 12% to 9% (a result likely influenced by the omission of California). Black voters increased their share from 2008 to 2016 in four of the states CNN examined, while Latinos grew in six of them, most dramatically in Pennsylvania, Nevada and Georgia. The fact that black voters represented more of the vote in 2016 than in 2008, when Obama became the first major party African-American nominee, underscores the enduring nature of the change, which may reflect not only growing engagement among blacks but also reduced participation in Democratic primaries by whites, especially in Southern states. College-educated voters of all races grew from 46% of the cumulative vote in 2008 to a 53% majority in 2016. College graduates increased their share of the vote in seven of the eight states for which data was available for both years. 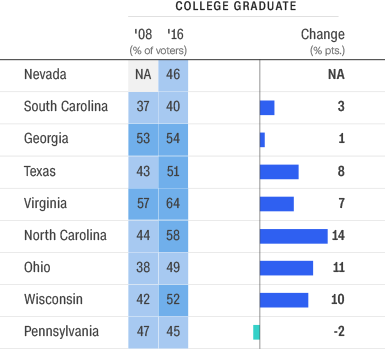 Typically these increases were substantial: College graduates rose as a share of voters by double digits in North Carolina, Ohio and Wisconsin, by 8 points in Texas and by 7 in Virginia. Women grew slightly from 57% of the cumulative vote in 2008 to 58% in 2016, the analysis found. Although a cumulative analysis of the 2004 electorate wasn’t available, the results from individual states in that race, such as Texas and Ohio, suggest women notably increased their role from 2004 to 2008, and 2016 consolidated that shift. Given the intensity of the female backlash against Trump, particularly among black and college-educated white women, Mook says, “I wouldn’t really be surprised if you come back in a few years and it was 62 or 63% women” in the 2020 primary. While the share of the very youngest voters, aged 18-29, grew from 14% in 2008 to 17% in 2016, voters older than 45 still accounted for three-fifths of all primary voters last time. That three-fifths ratio proved remarkably consistent across major demographic groups: voters 45 and older accounted for almost exactly that share of white male, white female, black male and black female voters. Some private analysis conducted for Democrats eyeing 2020 has found the potential electorate tilting even slightly more heavily toward older voters. Despite claims that party loyalty is eroding, exactly three-fourths of 2016 primary voters identified as Democrats, with only one-fourth calling themselves independents or Republicans. Those numbers were virtually unchanged from 2008. While Sanders carried almost two-thirds of independents, Clinton beat him by nearly 2 to 1 among the much larger group of Democrats, the analysis found. On ideology, the cumulative analysis found the share of Democratic primary voters who identified as moderate or conservative dropped from just over half in 2008 to 2 in 5 in 2016. Voters who identified as very liberal increased from around 1 in 5 in 2008 to about 1 in 4 in 2016; the largest group, at 36%, was voters who identified as somewhat liberal. (That was also a big increase from around 3 in 10 in 2008.) In 2016, Sanders ran evenly with Clinton among the very liberal voters, but she carried the other three groups by double-digit margins. The new fulcrum of power in the Democratic coalition becomes more apparent when looking at the intersection of these trends. The single largest group in the 2016 Democratic primary electorate was white women holding at least four-year college degrees: They cast fully 21% of all votes in the cumulative analysis. Next were African-American women at all education levels and white men with college degrees, at 16% each. They were followed by white women without college degrees, at 14%, non-college white men, at 12%, and African-American men (of all education levels), at 8%. Latino women and men, of all education levels, cast 5% and 4% of the vote, respectively. Voters from other races and mixed-race backgrounds cast the remaining 5% of votes. The combined 26% of the Democratic vote cast by non-college white men and women in 2016 represented a significant decline from their 32% share in 2008. College-educated whites, by contrast, increased their share from 32% in 2008 to 37% in 2016. Following the sharp shift of college-educated white women toward Democrats in last fall’s midterm election, most observers are expecting them to further increase their prominence in the 2020 primary. “After 2018 there’s no doubt that college white women will grow as a percentage,” says Tulchin. After 2018 there’s no doubt that college white women will grow as a percentage. The ideological implications of these shifts are more complex than many might assume. The growing prominence of college-educated whites does tilt the contest to the left, because they are the most liberal component of the Democratic primary electorate: In the cumulative analysis, 33% of those women and 28% of the men described themselves as very liberal. Just over another two-fifths of each group described themselves as somewhat liberal. Primary voters under age 30 were also much more likely to identify as very liberal (with just over one-third picking that label). But the growing presence of minorities has a generally moderating influence: just 21% of African-Americans, and 23% of Latinos, who voted in 2016 described themselves as very liberal, the cumulative analysis found. Similarly, only 22% of non-college whites who participated in 2016 identified as very liberal. About two-fifths of both blue-collar whites and Latinos described themselves as moderate or conservative, while that number swelled to half of African-Americans. In striking contrast, fewer than 3 in 10 college whites who voted in the 2016 primaries identified as moderate or conservative. Even younger African-Americans and Latinos were less likely than younger whites to identify as very liberal in 2016. There is a myth that African-Americans and Hispanics are liberal, and guess what: They are more conservative than white Democrats. The most liberal voters in the Democratic primary are college whites. Belcher cautions that some African-American voters resist identifying as liberal not so much because of their policy views as because they view that label as incompatible with their religious devotion. But historically, whether for reasons of ideology or personal style, the white liberals who are the most attractive to college-educated white primary voters -- from Gary Hart in 1984 to Paul Tsongas in 1992 to Bill Bradley in 2000 -- have struggled mightily with black voters. Sanders continued that tradition in 2016: Although he ran slightly ahead of Clinton with African-Americans under age 30, overall he carried only about one-fifth of black voters, the cumulative analysis found. Clinton won an astounding 87% of black women aged 45-64 and 91% of those 65 and older. Even with a potential strong base of support among younger and college-educated whites, Sanders and Elizabeth Warren, as the leading white progressives in the field, will face an uphill climb in 2020 if they can’t significantly improve on those numbers. “If you can’t compete (for African-American voters) in South Carolina … the path for you to the nomination is very narrow,” says Belcher. Because so many African-American voters, especially in the South, are relatively more moderate, they constitute a critical bloc of support for any white candidate looking to run more toward the center. Support from African-Americans was critical for Bill Clinton in 1992, Al Gore in 2000 and Hillary Clinton in 2016. 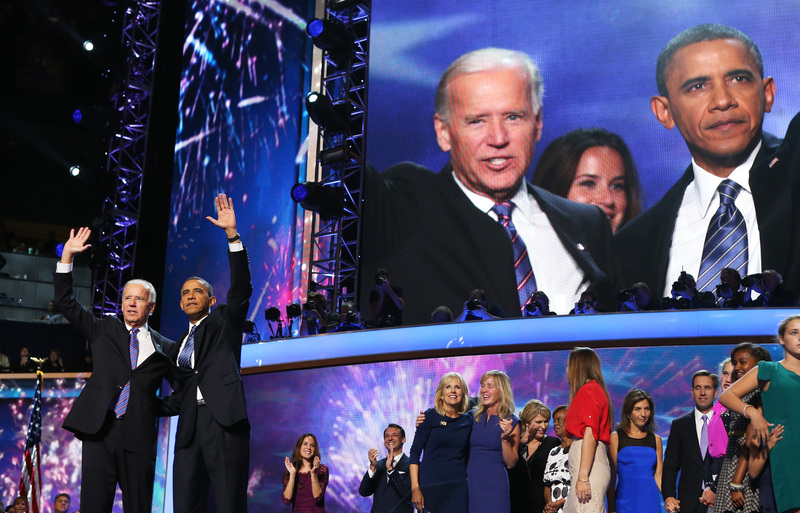 Joe Biden and Barack Obama accept nomination for president at Democratic National Convention in 2012. That history explains why Biden faces a mirror-image challenge to more liberal alternatives such as Sanders. If Biden runs, he’ll need to maintain a competitive level of black support because there probably are no longer enough white moderates to fill out a winning coalition. If California Sen. Kamala Harris, or New Jersey Sen. Cory Booker, emerges after the early primaries with a decisive advantage among African-American voters, Biden could face a tight squeeze since most college whites may prefer a more liberal alternative. Meanwhile, the solidifying dominance in the primary electorate of female voters could benefit the historic field of female contenders. In particular, many strategists planning 2020 campaigns agree that college-educated white women and African-American women are likely to emerge as the most influential constituencies in the contest. Harris, a female candidate with a black father and professional pedigree as a prosecutor and California state attorney general, may be uniquely positioned to benefit from the growing prominence of those two groups. The catch is whether Harris can consolidate most of the support from either or both groups, with so many other candidates splintering their vote, especially before the field narrows after the early states. Biden supporters believe that Amy Klobuchar’s entry into the race, in particular, threatens Harris because the Minnesota senator could compete so effectively for college-educated white women in Iowa. In a state with very few African-Americans, those women are Harris’ most likely foundation of support. And others may target Harris’ record as a prosecutor in California to try to erode her appeal to African-American voters, especially younger ones, who polls have shown are highly motivated by criminal justice issues. Indeed most strategists working on 2020 agree that one of the contest’s key dynamics is the likelihood that all of the candidates initially will face multiple competitors for their preferred demographic and ideological groups. Among the potential contenders, only Biden, if he runs, will likely follow a strategy of looking to maintain broad support among almost every demographic group in the party -- and even he would likely tilt toward older and less ideological voters. All of the others face the probability of relying much more on some groups than others. “Every candidate has multiple competitors for their lane, or the multiple lanes, that they are trying to appeal to,” says Tulchin. Every candidate has multiple competitors for their lane, or the multiple lanes, that they are trying to appeal to. 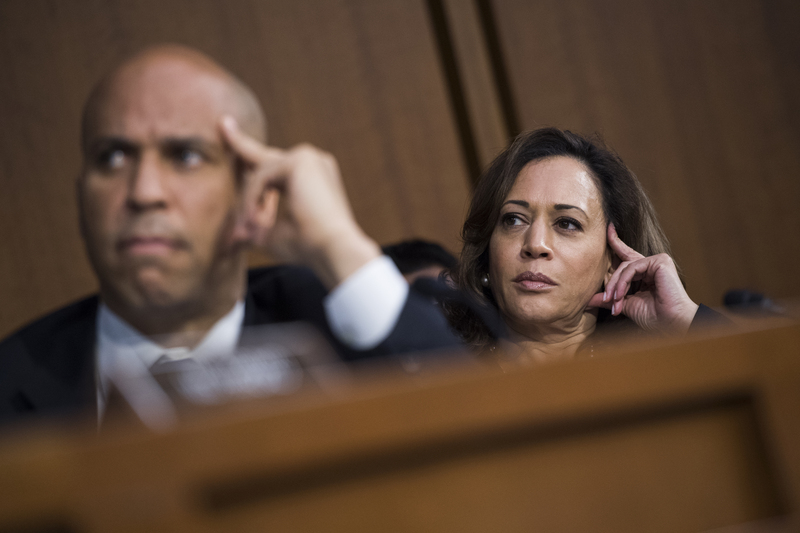 Just as Booker and Biden, for instance, could jostle with Harris as the principal competitors for the support of black voters, Warren, Harris, Klobuchar and Kirsten Gillibrand are all likely to focus on well-educated white women. Sanders and Beto O’Rourke, if they run, would be considered the leading contenders for young voters, but Warren, Harris, Booker and South Bend, Indiana, Mayor Pete Buttigieg, the first millennial candidate, may also siphon their share. Sherrod Brown, Sanders, Biden and Klobuchar would target blue-collar whites. In such crowded conditions, the candidates who can, in effect, clear their lane first will have a big advantage over those who are still splitting their best groups with other viable alternatives. Historically that winnowing process has occurred very quickly: Since at least 1992, no more than two candidates in the Democratic primaries have appeared fully viable after the first two contests, in Iowa and New Hampshire. But the sorting process could prove less decisive and more protracted in 2020. Follow @RonBrownstein on Twitter as we explore part two of this series next week.